UPDATE (Friday January 15, 2016): Congratulations to Patrick and his team, the film has just been nominated for an Academy Award for Best Live Action Short. Good luck! Patrick Vollrath’s 30-minute film drops us into the life of Michael Baumgartner, divorced father of 8-year-old Lea. As the film begins, he’s anxiously waiting to pick her up for his regular visit. His anxiety doesn’t end when she happily greets him, however. And his refusal to even meet the eyes of his ex-wife let us know that something is up. As he takes Lea to a toy store to choose anything she wants, and then to a photo booth where he encourages her to pose for some “neutral” photos after the silly ones, we realize he’s planning to take her away. As it begins to dawn on Lea that something’s not right with Daddy, the film subtly shifts to her perspective. Alles wird gut is something spoken to the young girl twice in the film, and in each case, we share her skepticism. Vollrath’s film is gripping from start to finish, with fantastic performances from the two leads. 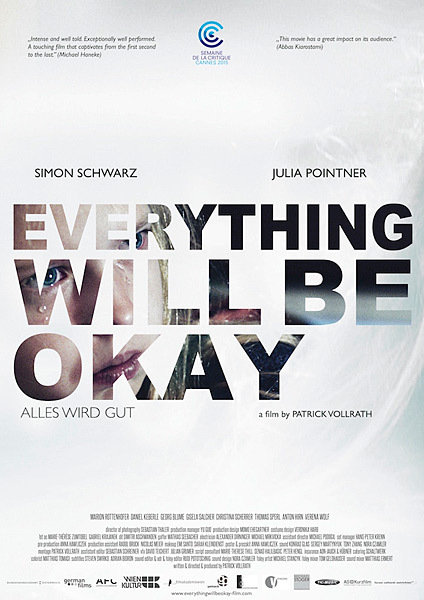 Simon Schwarz ably portrays the desperation of a father terrified of losing his connection with his daughter, but especially noteworthy is young Julia Pointner in her very first film role. She carries the film in the ironic position of the voice of reason. Watching her reach a state of near-catatonia as her parents engage in a literal tug-of-war for her is heartbreaking on many levels. The handheld cinematography also adds to the sense of immediacy. Vollrath won a Student Academy Award this year for the film and Alles wird gut has been collecting other prizes on its festival run. If you get a chance to see this remarkable short film, don’t miss it!